Wincor Nixdorf (Leading IT solution provider to retail banks) and Mahindra Comviva (mobility solution provider) have collaborated to offer a safer experience at ATMs. They’ll do this by making the transactions cardless using QR Code and NFC technologies. Hence, consumers using Mahindra Comviva’s Mobiquity Wallet can add credit or withdraw cash from ATMs simply by scanning a QR Code. 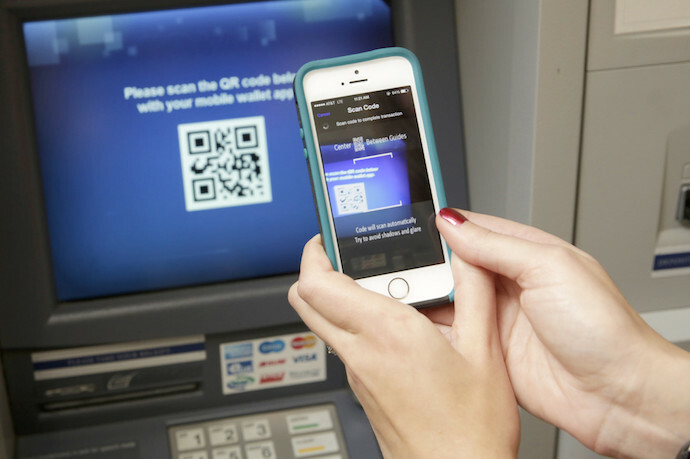 Also, the users have the option of presenting the QR Code generated on their app to an ATM scanner. Or even tap the NFC tag. The concept was first displayed during Mobile World Congress 2016 at Fira Gran Via conference facility in Barcelona, Spain. We are continuously innovating to ensure that the consumers get a seamless transaction experience. Collaboration with Wincor Nixdorf , as a result, will help in boosting our consumer focus. This will happen by enabling mobile wallet transactions at ATM using technologies like NFC and QR code. The NFC offering will ride on our mobiquity® Wallet’s HCE rails. This is to enable secure communication between the consumer’s phone and the ATM through a token based transaction. Our cooperation with Wincor Nixdorf is significant. Because ATMs have been proven to be a secure, reliable and highly automated service channel. The Open Wallet Interface offered by Wincor Nixdorf is well supported by Mahindra Comviva Wallet. Therefore, users can easily withdraw and deposit money at ATM using the wallet. ATM Networks as a sales and service channel will play an increasing role in the mobile wallet strategy to deliver an omni-channel-experience. And higher security in interacting with their customers. With standardized interfaces, such as the Open Wallet Interface, we make integration easier. And hence, even support mobile wallet providers with extensive services. Also, see how cardless transactions using QR Code technology are becoming popular as the method is faster and much safer. Have a comment? Leave one in the comments below to start a discussion.